I had about half an hour to whip up an appetizer before our friend Sean came over. Our plan was to meet up at our house, watch the Cubs game and then head to Looptopia. Looptopia is a great idea based on the vibrance of European cities, the artistic aspect, the energy and the excitement of thousands of people in the heart of the city after hours. The idea is great, the execution could use a bit of help though. This was the second year, and we found less artists, less interesting dancers or musicians and just more young kids running through the streets. What to make? I hadn't planned anything so I really needed to just pull an idea out of my head. With a handful of baby potatoes and fresh bunch of parsley, this came together so nicely that I'm thrilled with it and so excited to make it again. It's completely simple and you can use this as a topping for many different uses, cracker dips, pizza topping, a pasta sauce or even a sandwich spread. To start, wash your potatoes and bake them until soft. I used about ten potatoes, and these are the mini red potatoes. Olive oil, use enough to make the pesto into a bit of a sauce consistency. Cut the potatoes in half, scoop out the tiny center of the potato so you have a place to put the pesto. 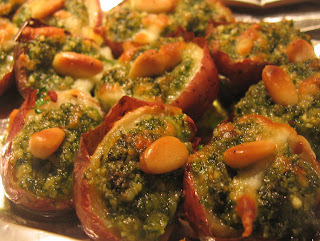 Fill the potato halves with the pesto and top with toasted pine nuts and a sprinkling of cheese. Now place these back under the broiler until the cheese is melted . Serve immediately. Your going to love the hint of mint in this, it gives a great little unexpected flavor explosion! You can whip this up in no time, it's that simple. We went on to Looptopia, acted silly and we were fat and happy!